Dave Specht believes family businesses are built on a solid foundation of the three G’s: gratitude, goals and grit. 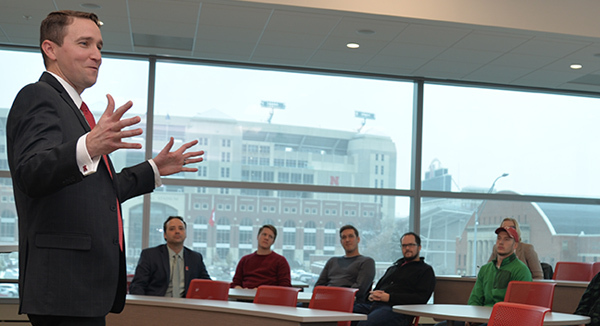 The University of Nebraska–Lincoln Center for Entrepreneurship kicked off a new initiative called Nebraska Family Business this week in Howard L. Hawks Hall promoting strong family businesses in the state. Dave Specht, national development manager for family dynamics at Wells Fargo PrivateBank, focused on the fundamentals of what it takes to maintain a successful family business built on more than just financial achievement. Specht explained how family values transition from one generation to the next, and when they do not it is difficult to perpetuate the ideals that originally got the business off the ground. He sees the long-term viability of the business itself in peril when values are lost. To further build family bonds, Specht teaches examining family history by going back four generations and exploring ancestral achievements that led to the present day. “It takes a great amount of intentionality to not only communicate your values and expectations, but create experiences for the next generation to develop those values. It’s difficult to manufacture what scarcity feels like if you’re not poor. It takes extra work,” he said. According to Specht, having an experience-rich next generation is key to solving the puzzle of transitioning values. It creates a solid foundation for the three G’s of gratitude, goals and grit. To further build family bonds, Specht teaches examining family history by going back four generations and exploring ancestral achievements that led to the present day. He believes immigration stories can be vital to instilling the value systems of past generations into the present. He also works with his own children to practice gratitude every day. “Where there is gratitude entitlement can’t live. If you find someone who is entitled, they aren’t expressing gratitude. So I work with my children on recognizing their blessings. Recognizing and verbalizing those blessings instills gratitude,” he said. Dr. Sam Nelson, director of the Center for Entrepreneurship and assistant professor of practice in management, plans to create similar events centered around family businesses going forward. He believes Specht resonated with the multi-generational audience in attendance, which included students, faculty, alumni and other business partners. “There’s a huge family business presence in Nebraska, and with this new initiative, we want to take a closer look at the topic. We’re building a network for students who are either building a family business themselves, or planning on running their family business. This network will give them a chance to work with peers that have dealt with similar issues,” said Nelson. To learn more about Nebraska Family Business and Specht, visit: https://business.unl.edu/familybusiness.